Instantly, you can see any apps that are in need of an update. 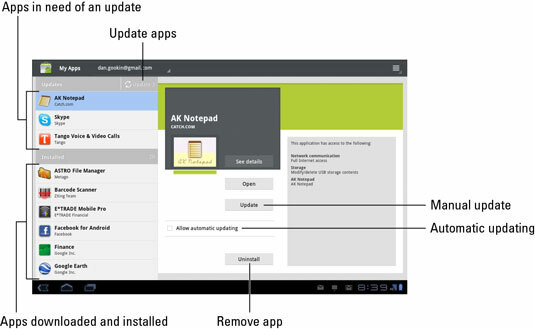 Touch an app to see details about the app, such as the details for the AK Notepad. You can touch the See Details button to read more about the app, though the most handy thing to do is to use the Open button to run the app. You can place a check mark by the option Allow Automatic Updating, which assists in keeping your apps current. Also, there’s that Uninstall button, which removes the app from your Tab. The list of installed apps shows all the apps you’ve downloaded on your Galaxy Tab. Some apps on the My Apps screen might not be installed on your Galaxy Tab. For example, they could have been downloaded and then removed. They appear at the bottom of the app list under the heading Not Installed. Uninstalled apps remain on the My Apps list because you did, at one time, download the app. To reinstall them (and without paying a second time for paid apps), choose the app from the Not Installed list.